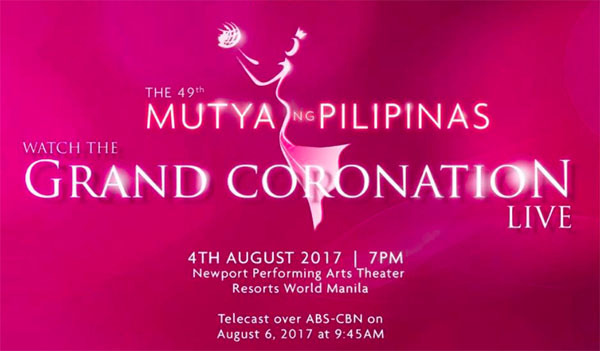 The winners of Mutya ng Pilipinas 2017 beauty pageant will be crowned Friday night, August 4, 2017. Reigning title holders Ganiel Akrisha Krishnan Mutya ng Pilipinas-Asia Pacific; Justin Mae San Jose Mutya ng Pilipinas-Tourism International; and Michelle Thorlund Mutya ng Pilipinas–Overseas Communities will crown their successor at the end of the event. Where to watch Mutya ng Pilipinas 2017? Mutya ng Pilipinas 2017 will be broadcast live via Rappler’s official live streaming channel on August 4 and will be telecast on ABS-CBN on August 6. Pageant starts at 7pm. Keep locked on this this page, Mutya ng Pilipinas 2017 coronation night, final results, winners, live coverage and updates will be added below.